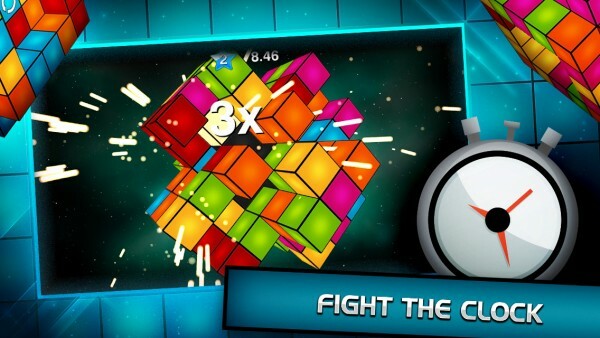 Polyform (3D cube puzzle) ($2.99) by DeNA Co., Ltd. is a rad new take on the traditional match-three puzzle game. 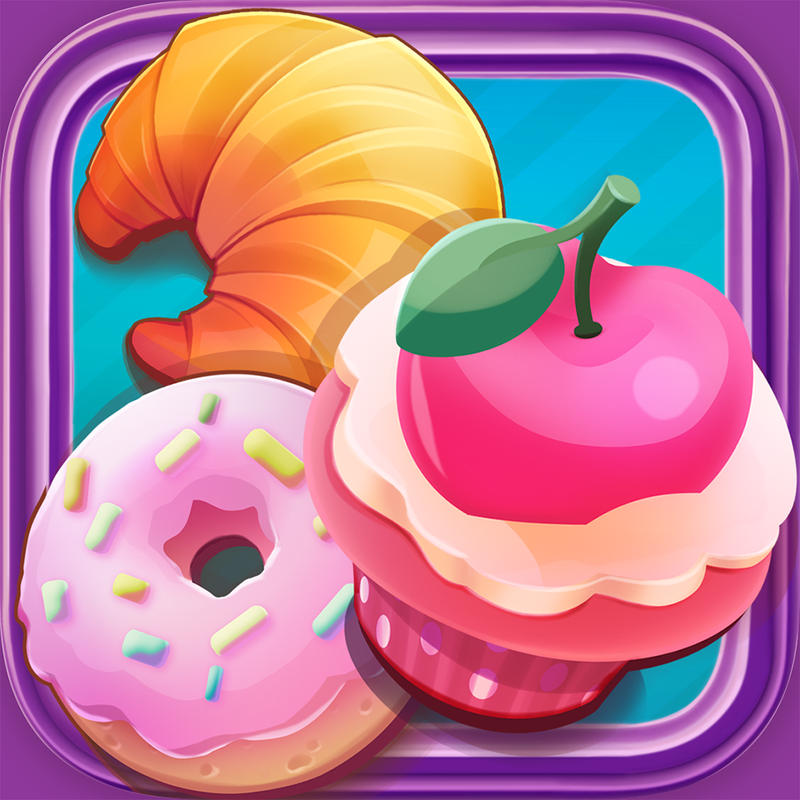 If you enjoyed games like Cubis or Cupcake Carnival (also from DeNA), then you will enjoy what Polyform has to offer in the match-three space. Puzzle games are my forte — I’m always playing them, especially the match-three kind. There’s just something about quickly matching colored pieces up and watching the explosions that big combos make on the board that make me giddy. Plus, they’re pretty good at keeping my mind stimulated, which I like. The problem with match-three games, though, is the fact that they are always so similar to each other — there hasn’t been any innovation in the genre, so to speak. That is, until Polyform. The graphics in Polyform are stunningly beautiful. I mean, it’s not always about how a game looks because gameplay is more important, but this one is gorgeous. 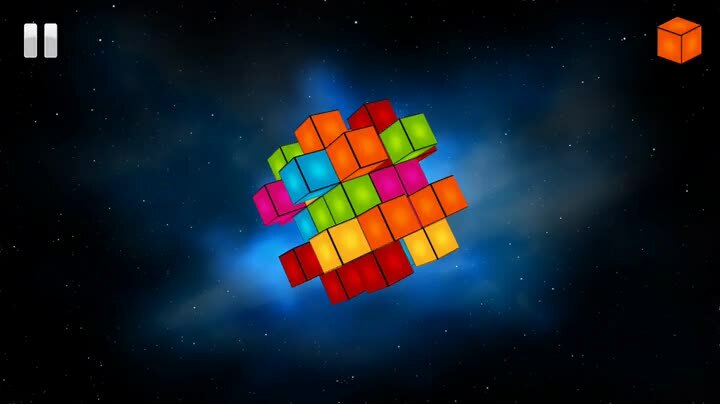 The background colors are soothing as they are mixed in with stars, and the bright and vibrant colors of the 3-D cube mass (reminiscent of a Rubik’s cube) contrast nicely against it. Everything is sharp and crisp, so it looks fantastic on Retina screens, and the animations are smooth and fluid as you play. To top things off, Polyform has an ambient atmospheric soundtrack and fun sound effects. Like most other puzzle games nowadays, Polyform is level-based, but there are also three difficulty levels to go through (easy, normal, and hard). Each difficulty has 30 levels for players to spin and match through, so there’s 90 puzzles to solve, and each puzzle has a different layout. 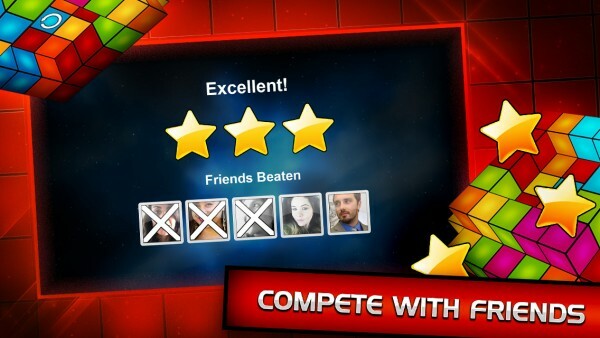 The levels are unlocked in linear order, so you have to beat a level in order to progress. 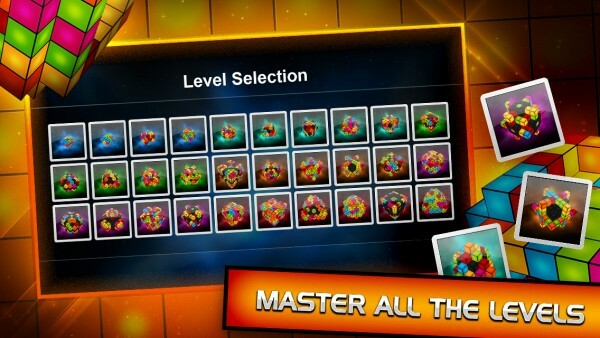 Players can earn up to three stars on a level as well, with the star being received after all blocks are cleared out in a limited time threshold — the faster you are, the more stars you’ll get. The controls in Polyform are super simple and intuitive. 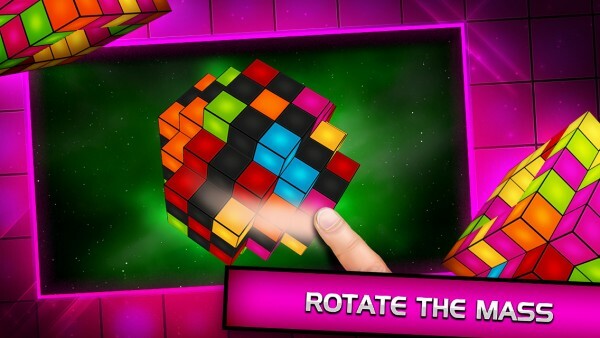 To rotate the 3-D cube mass, just drag your finger around on the screen, and you’ll get a better view of all sides. 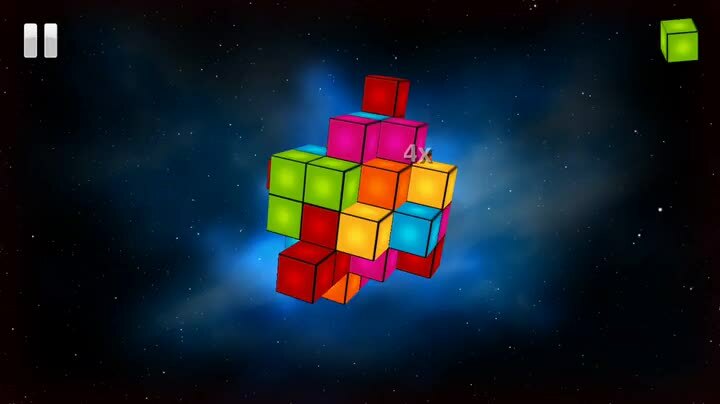 In the top right corner, you will see a single colored cube — this is the next piece that you have to place on the cube. To plop the block down, just tap on where you want it to go on the mass. 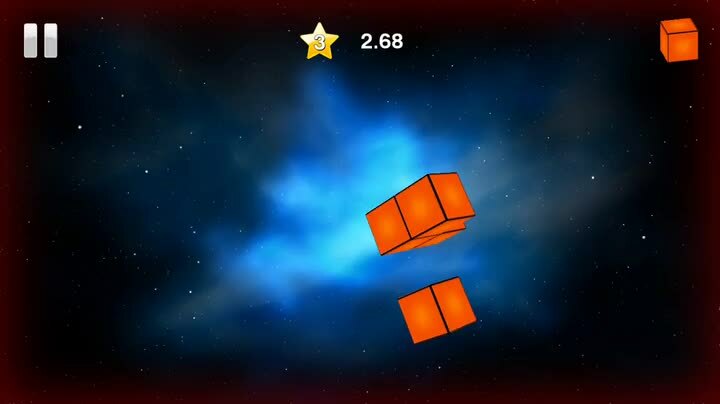 The objective is to clear out all of the blocks in the time limit (at least one star is needed to advance), and the pieces only get cleared out when you get at least four of them together in a cluster. It may sound easy, but things get hectic as the clock winds down. 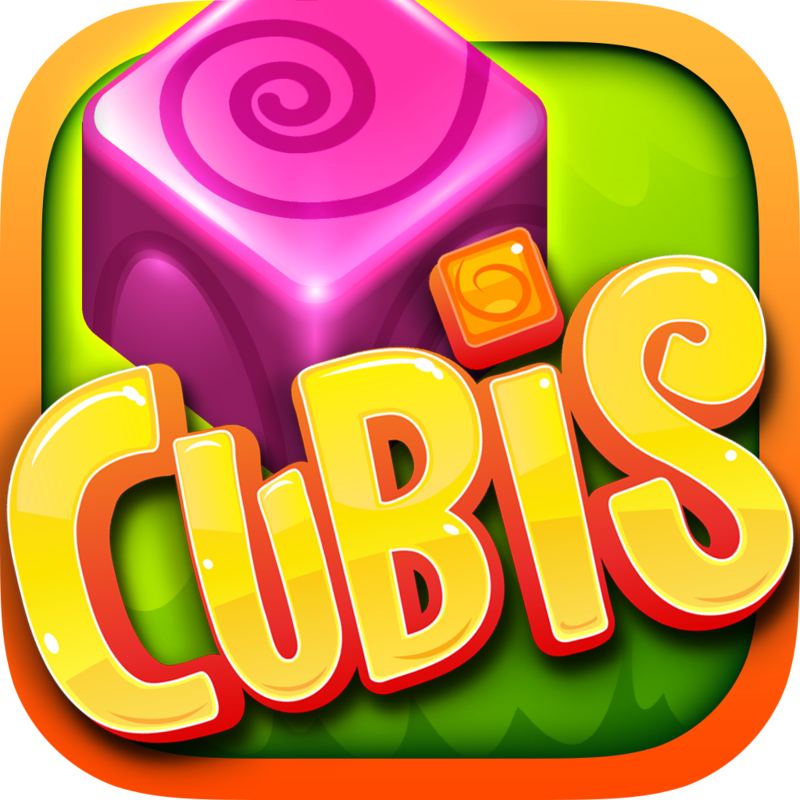 As you get further in the game, there will be special cubes to unlock and discover. These have the ability to clear out all cubes of a single color, clear out any adjacent cubes, give you more time, and more. 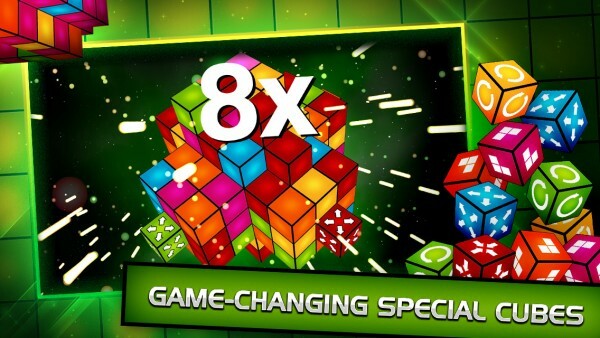 Fortunately, these power-ups will all be available in the game and not through in-app purchase (there’s none of that to be found), so the game relies entirely on your 3-D cube matching skills. If you’re a social gamer, DeNA has provided support for Facebook, so you can compete with your friends to see who has the best score on a level. There is also Game Center integration, but only for achievements. I’m a bit confused as to why they would leave leaderboards out of Game Center, because I don’t like using Facebook too much for games. Despite that minor flaw, I’m enjoying Polyform a lot. The game looks great, the music is soothing, the controls are intuitive and responsive, and the gameplay is fairly challenging, even for veteran puzzle game fans. The best part is that there are no in-app purchases, so it’s all about your skill level here, and there are even three difficulty levels to choose from. There’s something for everyone in Polyform. I highly recommend giving this game a try if you enjoy color matching puzzle games with a twist. You can find it on the App Store as a universal download for $2.99.